Upgrading from a MacBook to a PowerBook? My Rev. B iMac Lives! You can configure this machine with a weight range from 2.5 to 3.17 lb. For example, you can insert a bezel (included) in place of the DVD burner, or you can leave it installed inside the machine. This is one seriously superior machine to Apple's offering. The Apple has only two advantages: it's 4 mm thinner (does anyone care? ), and it runs Mac OS X. In every other respect it will be vastly outclassed by Lenovo's latest. I think my MacBook is wonderful, but I'm looking for a new machine that saves a couple pounds. Lenovo seems to have figured out the formula. Why can't Apple? Apple and Lenovo had very different design goals. Apple wanted to create a field computer to supplement your desktop Mac. Lenovo wanted to create a road warrior machine where your notebook could be your primary PC. The only drawback is that a 64 GB solid state drive is going to drive up the price significantly and not be enough storage for a lot of road warriors. Using the 160 GB hard drive found in the iPod classic would solve both problems. There's no denying that the X300 has it all over the MacBook Air in terms of hardware- faster CPU, expandable RAM, lighter weight, more ports - while the MBA is thinner, beautiful, and runs Mac OS X. But hack OS X for the Lenovo, and you'd have a killer machine. I have been reading Low End Mac for close to about three months now, and I have come to appreciate the articles on the site with advice on Macs. I have a question. I have a MacBook which I bought recently as my first Mac. Its one of the newer models with 2.2 GHz Intel Core 2 Duo and 2 GB RAM. As much as I am enjoying it, one of the really big drawbacks is the keyboard. I am a college student who writes a lot, and I have rather large hands. Although many people have touted the keyboard as revolutionary, typing for long periods on the keyboard really puts a strain on my hands. Like many out there, I waited for Steve Jobs' keynote this week in the hopes that he would release a 12" PowerBook replacement and was rather disappointed with the MacBook Air. I say this because for a while I have been considering selling this MacBook and buying a used 12" PowerBook. I'm all for portability, and I have no problem finding Mac alternatives for the Windows programs that I used to use. My only dilemma (as stupid as this may sound) is that I'm stepping down rather than up in terms of a product. I'm into my second year in college and have two more years left. Would it be suitable to sell this MacBook and go for the PowerBook? Also, should Apple release a new operating system before the two years are up, then would the PowerBook support it? In terms of writing, the PowerBook keys are perfect for writing in that the keys are larger and more suitable, in my opinion, for the purpose. Yet at the same time I can't help feeling that the keyboard alone is an insufficient reason to want to get ride of the MacBook. I would appreciate your thoughts and advice on this. If you're getting what you really need - a better keyboard for all of your writing - then moving to a 12" PowerBook from your 13" MacBook would be an upgrade. While it's not as fast and can't run Windows, it's filling a very real need for you. Upgrade the keyboard and portability; downgrade CPU speed. Sounds like a fair trade to me. Another option is to buy a good keyboard for writing and stick with the MacBook's built-in keyboard for taking notes. There are lots of good USB and wireless keyboards out there that work just fine with the Mac. When I ran Low End Mac from my 400 MHz PowerBook G4, it was primarily with an external wireless Logitech keyboard and mouse - which I'm still using seven years later. If it fits your working style, that would be a far more economical choice than selling your MacBook and picking up a nice used 12" PowerBook G4. I had an indigo 400 MHz Summer 2000 iMac that I bought refurbished from the Apple Store in March 2001. $750 or thereabouts. Over the years I upgrade RAM and a hard drive, and experienced one lightening strike, which took out one FireWire port. The iMac sat in front of an east-facing window which always had indirect sunlight. Last summer I replaced a battery in the iMac, as one day it wouldn't start. Easy enough to do, popping this and that out, remove and replace the battery, and back in business soon. The only odd thing was the power cord seemed a little bit loose. Well, two weeks later, in August, the iMac did not start again. Hmmm. I again popped out the shell had it on its end and was surprised to see fragments of hard rubber fall on the desk from the iMac. I believe it was the female plug or holder of the power plug, which completely disintegrated! There was, all across the motherboard, bits and pieces and dust from the plug. No iMac! I had counted on that iMac to work another three or more years. At that point I asked my college student daughter to get an early family Christmas gift, a MacBook during the college iPod promotion. We now have a new white May 2007 MacBook, and my other daughter got a new iPod as a gift. For value, the education promotion in my mind is a very good deal if you have a son or daughter in college. I was able to recover data on the internal hard drive (and AppleWorks and Toast Titanium 5.2.3) by buying an external hard drive case from OWC. Apple Works 6.2 works very well on the MacBook, translating current Word and Excel files sent to me. I also transferred Graphic Converter from my old iMac hard drive. Note - my Performa came in handy for the week or so between iMac and the MacBook. The 635 Performa worked well. I connected the DSL to my 2001 vintage Asante hub, and I was in business again. All in all, the iMac served faithfully from March 2001 through August 2007. And I was able to reutilize the old hard drive and software too. It's great to hear from you again! (Matt's Mac appeared for over a year in 2001/02.) I'll bet you could find a replacement power connector from a dealer who specializes in Mac parts or from someone on the LEM Swap List who is parting out a dead slot-loading iMac. I just hate to see a Mac taken out of service if a simple fix might restore its usefulness. Congratulations on the MacBook - and the incredibly long life of your Performa! That was one of the most flexible models Apple ever made, definitely ahead of its time with the TV tuner card. Congratulations. I wouldn't have had the patience you exhibited in getting this iMac up and running. You're still writing about Claris Home Page, so if you don't mind I'm going to throw at you a question. First the background. 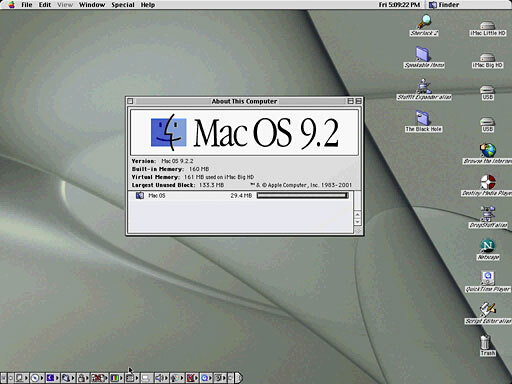 I used Macs exclusively from 1993 to 2003, the last one being a G3 which died. At that point my youngest, a boy, was 15-1/2, and he insisted on a PC because "there are no games on Mac." So I went over to the dark side. I'm in Israel. I first put my site up in 2000 using Claris, which I found on the Web. I even wanted to pay for it, not having yet been corrupted by my exposure to the Web, and sent an email to an address given in Germany. They never answered, so what can you do? The new PC arrived, and I called a guy who had every program ever made on his PC and asked him if he had Claris for Windows. Sure enough. So I was able to keep on truckin'. In the course of seven years I must have produced close to 100 pages with Claris, and still I don't know any code that I am aware of. I got a steady steam of viewers for my pages, but nothing huge. Then last month I put up a page critical of Reddit and got inundated. What made me cringe was that I checked the page on my son's spanking new PC, which does everything but fly, and he's got a wide screen. The page was spreading out to fill that wide screen, which made it look like hell warmed up. I put up a note to the viewers recommending they use the old standard small screen and then went looking for an HTML editor to correct this, in other words, freeze the width on all monitors. To the question. Is there an editor that will freeze the type width in all monitors? Is it possible in Claris? I'm hoping to go back to do some serious writing soon, so for that I'm again going to get some kind of Mac. The only venues I've been comfortable in writing is an old-fashioned non-electric typewriter and Nisus. Since I now prefer to depend on computer memory rather go back to scavenging through piles and piles of paper every time I want to check something, it has to be Nisus. When that happens in the next few weeks, I'll be sending you another question, where I can get Claris for Mac today? If you want to assure that your writing doesn't run to the edges of the browser window, you can either use a three column table with fixed widths on the first and third columns or use Cascading Style Sheets. Just a quick question (I've looked everywhere for a definitive answer but could not find one): To connect a USB 2 device to a USB 2 computer, do I have to use a USB 2 cable? And if I use a USB 1.1 cable, what happens (compatibility, speed, etc.)? I would very much appreciate any clarification you can provide. There's no such thing as a "USB 2.0" cable. Cables are passive devices that work at whatever rate the ports they are connected to allow, so a "USB 1.1" cable will work at USB 2.0 speeds when connected to a USB 2.0 port on your Mac and your USB device. I don't know if you're still looking for these sorts of reports, but if you like, here is my experience. I had been running 10.4 for some years without issue, but I decided to take the plunge anyways. I used iCode's Leopard Assist to prepare the system for installation. Since the system was cluttered up with a bunch of software I hadn't used in some time, I decided to perform a clean install, backing up more critical things like my emails and documents to another drive. I also braced myself for the long boot due to the GeForce 6200 issue. The install took about an hour and a quarter with no particular drama. After the initial boot, I removed the kext that causes the long boot times and then downloaded and installed all the updates Apple wanted. During this, the system seemed inordinately sluggish (kind of like running OS X 10.1 on a 604 or 603 based Power Mac), but would have moments where it would seem to speed up. A quick look at the Activity Monitor revealed that a process called MDWORKER and its accomplice, MDS, were the cause, collectively taking up all available CPU time. As it turns out, this was perfectly normal and soon went away (something to do with cataloging metadata or some such). Office 2004 installed without a hitch, as did RealPlayer, YIM, Photoshop CS, Adobe Illustrator, Dreamweaver, and even my old-enough-to-vote edition of FinalCut Express. The only issues so far have been an inexplicable issue QuickTime has with some .mov files - playing them, but showing only a white screen for the video (which, I might add, started before I upgraded to Leopard - more to the point, they started with the 7.4 QuickTime update). As per your requests, I Xbench'd both before and after the upgrade. Before score using Xbench 1.3 was 30.45; After was 24.56. The most significant decreases in performance were video related. The UI test in particular scored only half what it did in Tiger. Otherwise, the scores for the CPU and drive tests were close enough. Subjectively, the system feels more sluggish, though it does not seem to really be a matter of waiting for things. Safari, Mail, and the Office apps are all snappy enough. It feels slower than it is. Front Row, VLC, and DVD Player all work just as expected. In fact, I might note that VLC works even better than it did under Tiger (in my experience) - it does not crash nearly so easily anymore. As I mentioned previously, though, the one buggy program appears to be QuickTime, but that was an issue under Tiger as well. Overall, I'm pleased. Spaces is one of the best things to happen to OS X yet, and I suppose that I can also look forward to the usual increases in speed as updates are released as well. I also have to keep in mind that I'm running a configuration that Apple not only does not support, but actively discourages. With that, I can't argue. Thanks for sharing your experience with the upgrade to Leopard. We're always interested in hearing about unsupported installations.